We launched our forum today! 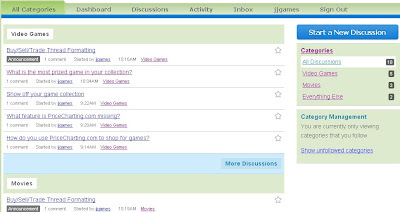 The video game forum is a place for gamers to talk about game collecting, buy/sell/trade games, discuss recent news, and exchange tips on great video game deals. There is also a section for movie collectors and discussion on any unrelated topic too. Anyone can read the forum but you need to have a free PriceCharting account in order to comment or send messages. Create an account today if you haven't already. Check out the forum today and let us know what the most prized game is in your collection. You can access the forum from any page on the site under the "All Categories" link in the menu. What Do you Want in a PriceCharting Mobile App?